When you hear the name xiaomi, the first thing that comes to your mind will probably be mobile devices and maybe smart TVs to some others. But if you are very familiar with xiaomi then you will know aside smart phones and smart TVs, the company is also well known for producing several miscellaneous gadgets such as air purifiers, smart shoes, bedside lamp, mi pen among other products. Now Xiaomi has decided to add one more to their list of products with the new Xiaomi wowstick 1fs Electric screwdriver. 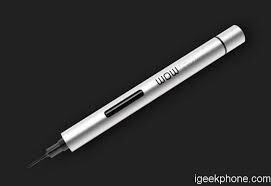 The wowstick is actually a portable electric screwdriver from xiaomi with a pen like design. The screwdriver is finished in aluminium and weighs around 234 grams. The electric screw driver features a led light which makes it useful when working in the dark. it also comes in both manual and automatic modes. According to Xiaomi, The screw driver will offer a speed of up to 100 rotations per minute and its also packed with a removable battery which will last up to 8 hours on continuous usage or 180 days on standby mode. 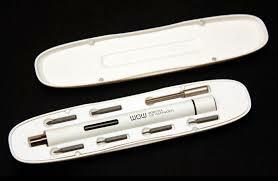 The packaging of the Xiaomi wowstick 1fs includes a wowstick 1fs electric screwdriver, an extension rod and six standard bits. But you can also order for the one with 18 bits if you really need more, though that will be slightly more expensive than the standard six bits. Although you can now find the screw driver on Xiaomi’s online store for $30 but shipping is expected to begin later in the September this year.